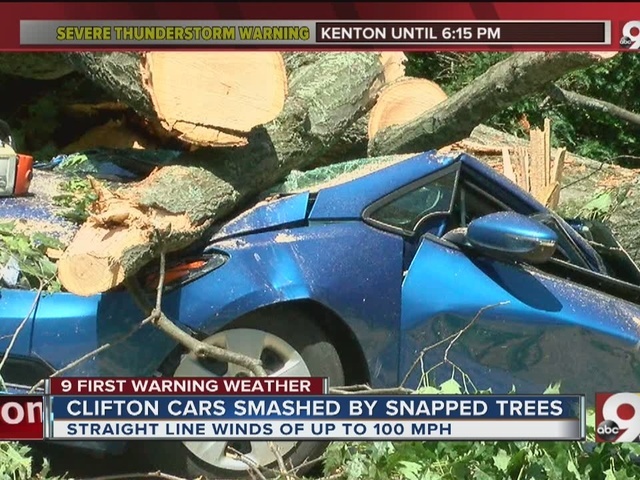 CINCINNATI -- The National Weather Service has determined a tornado touched down in Westwood but not Clifton during a storm that has left dozens homeless around Cincinnati and resulted in widespread power outages across the Tri-State. 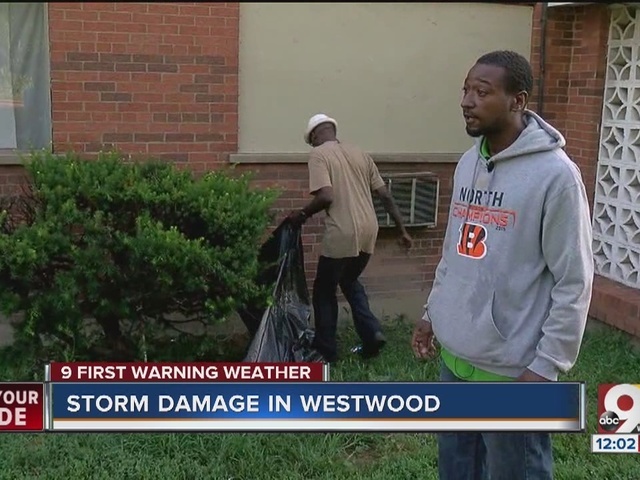 The NWS said it was an EF0 tornado that ripped through Westwood Wednesday night. 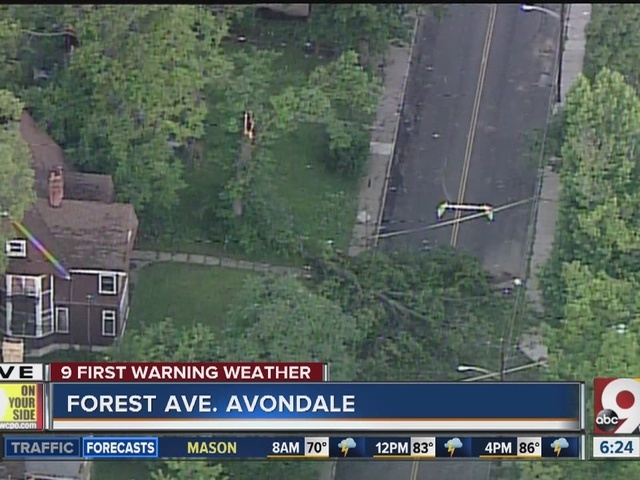 The first evidence of tornadic damage was observed near the intersection of Queen City Avenue and Westbrook Drive. Tornadic damage continued between Werk Road and Westbrook Drive, with the most significant damage occurring along Werk Road, and sections of Boudinot Avenue and Ferguson Avenue between Werk Road and Westbrook Drive. Tornadic damage appeared to end on Werk Road near the intersection of McKinley Avenue. Throughout the path, numerous large tree limbs and hardwood trees were knocked down, many pointing in opposing directions. Shingles were also removed from multiple sides of several residences. Damage was EF0 in nature, with maximum winds around 80 mph. The city's west side seemed to take the brunt of the storm's force with damage reported through both neighborhoods. 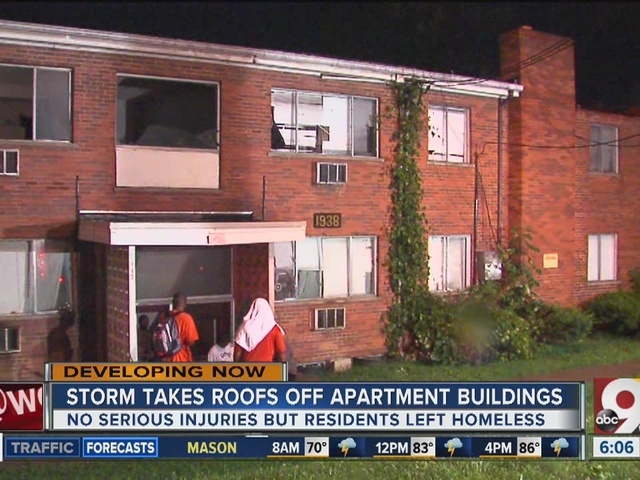 Officials determined straight line winds reaching between 90 and 100 miles per hour, not a tornado, caused the damage in Clifton and at The Flats apartment buildings in the 1900 block of Westwood Northern Boulevard, where roofs were blown off along with toppled trees and blown-in windows. "That tree is my new best friend. Because I thought I was gone. I thought I was going to go to Kansas," said resident Deandre Jones. "All I could do was army crawl and hug that tree and wait." Take a look at aerial footage of the scenes in the video player below. About 30 residents of The Flats are being assisted by the Red Cross after the storm put them out of a home. No serious injuries were reported, but resident Jones did need to have his leg checked because he was outside when the storm hit. Resident Thomas Hargis said, "All of the sudden you kind of hear that sound. I grew up in New Orleans and lived through tornados and hurricanes. You kind of recognize that sound. This howling wind that’s hitting it. I turned to my wife and said we have to get inside, we have to get inside." 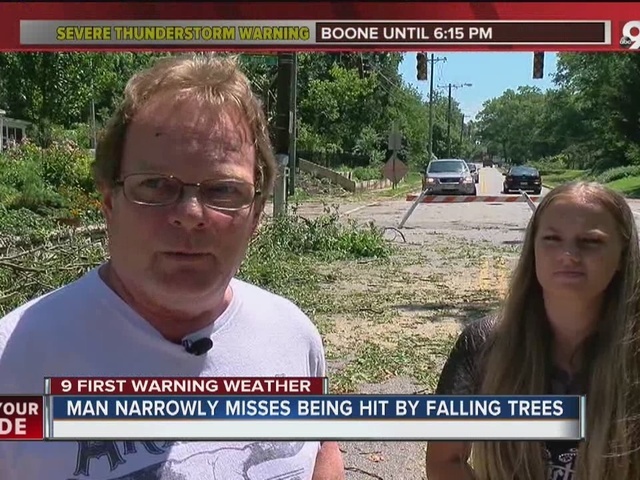 Gerard Morency was driving from his home on Westwood's Boudinot Avenue to his job Downtown when the storm blew through around 10:45 p.m.
Morency pointed to a huge tree laying across Werk Road. “Another eight feet, and it would have crushed my car,” he said. Several trees down closer Werk between Ferguson Road and Epworth Avenue. Police officers and fire crews were on hand and power was knocked out in the immediate area. 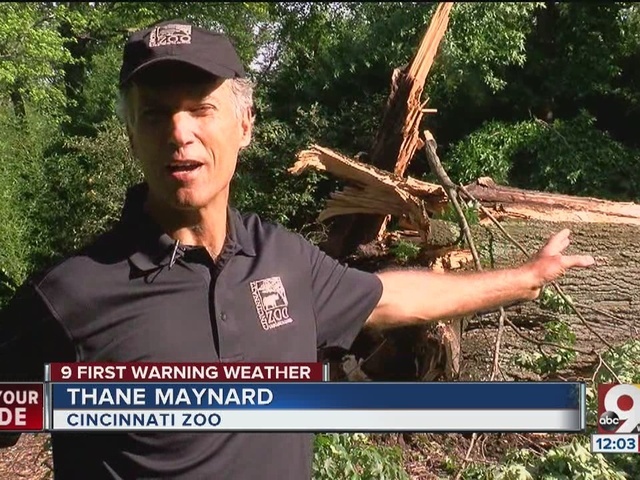 The Cincinnati Zoo saw some downed trees and debris throughout the grounds and decided to delay opening for the day until noon. Cincinnati State's campus remained closed until 10 a.m. due to power outages. 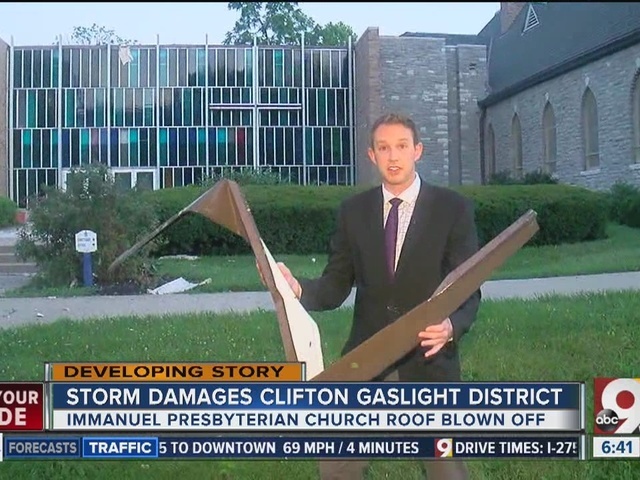 Over in Clifton, pieces of Immanuel Presbyterian Church’s roof were strewn over Clifton Avenue. “It happened in less than a minute, and you had all this,” resident Lovell Lathan said.